United were just too good. The Reds dominated right from the start and West Ham’s futile resistance only lasted until the 33rd minute when Wayne Rooney opened his account for the season from the penalty spot. Goals of unquestionable class from Nani and Dimitar Berbatov followed after the break, sealing as convincing and comfortable a 3-0 win as you are ever likely to witness. Avram Grant’s side arrived at Old Trafford bottom of the table and without a win in their first two games – defeats to Aston Villa and Bolton Wanderers, which on both occasions saw them concede three goals. Their narrow 1-0 midweek win over Oxford offered some respite, but the second round of the League Cup is a far cry from Old Trafford, and the gulf in class was brutally apparent. However, United too had a point to prove – which Sir Alex’s men would do emphatically – after dropping two against Fulham last weekend. Sir Alex made three changes to the team that drew 2-2 at Craven Cottage. Rooney, who missed the Fulham trip with a stomach bug, replaced Javier Hernandez up front alongside Berbatov. Nani was drafted in for Antonio Valencia, while Ryan Giggs replaced Ji-sung Park. The autumnal weather in Manchester – a seemingly random mix of wind, sun and rain – left a slick surface which, as well as encouraging a few late sliding tackles from West Ham’s feistier players, allowed United’s rapid passing to blossom. Rooney registered the first effort on goal after 10 minutes, shuffling across the edge of the box to fire a low, skidding effort into Robert Green’s arms. United’s attacking play was full of intent with Rooney, Berbatov and Nani at the centre of it. The latter two men combined on 20 minutes for a move that should have yielded the first goal. Vidic’s long, diagonal ball forward picked out Berbatov in space. The Bulgarian – nonchalantly as is his way – flicked the ball back into the path of Nani, whose thunderous effort crashed off the crossbar via a vital fingertip save from Green. West Ham, for their part, offered energy and industry but little genuine quality. And after 33 minutes United finally took the lead from the penalty spot. Paul Scholes’ sumptuous pass picked out Ryan Giggs on the left and he befuddled former Red Jonathan Spector and was subsequently clumsily fouled by the American. After Nani’s miss last week at Fulham, and with United’s talisman back in the team, there was no doubting who would take this penalty. Rooney stepped up confidently, arced his run and sent Green the wrong way to give United a deserved lead. Clearly in the ascendancy the Reds went searching for a second before the break. Darren Fletcher forced another fine save from Green, this time with a curling effort from 25 yards that West Ham’s shot-stopper turned around the post. Then Berbatov fired over from six yards with a difficult shot on the bounce, while Nani also shot over the bar with a lob that required a far more delicate touch to beat the onrushing Green. United went in at the interval with a slender 1-0 lead; fully dominant thought not completely ruthless in front of goal. But there was no profligacy from Nani five minutes into the second half. The Portuguese winger cut inside from his station on the right, had defenders back-tracking and falling over their own feet, then struck a vicious left-footed shot past Green from 18 yards to make it 2-0. United’s football at times was sublime, the neat trickery and interchanging play between Berbatov and Nani in particular catching the eye. Admittedly, West Ham looked lost defensively. Kieron Dyer hit the outside of the Edwin van der Sar’s post after 55 minutes, but it says it all that the Hammers fans almost didn’t notice, they were preoccupied with entertaining themselves with their repertoire of songs. The Reds’ third goal was the best of the lot and came after 69 minutes, unsurprisingly with Nani and Berbatov combining to score it. Nani pitched up a cross to the far post and Berbatov waited unmarked before scissor-kicking the ball past Green. Technically wonderful, with pin-sharp precision, summing up the Bulgarian’s input all afternoon. With the points wrapped up, Sir Alex made a triple substitution with fifteen minutes to go. Chris Smalling came on for his home debut, replacing Jonny Evans; Michael Owen made his first appearance at OT since suffering an injury in February, in place of Berbatov; while Michael Carrick came on for the, once again, impressive Scholes. The Hammers fans’ joked “we’re going to win 4-3” and even resorted to pretending they’d scored four goals to clinch victory. There was no chance of that, of course, United were a class above Avram Grant’s side. And while performances like this indicate that the Reds will be challenging at the top end of the table this term, so too it suggests that West Ham will be scrapping at the exact opposite end of the table. LONDON: Manchester United dominated a stuttering Chelsea to claim a deserved 3-1 victory over last season’s Premier League and FA Cup Double winners in a lively Community Shield season curtain-raiser at Wembley on Sunday.Goals from Antonio Valencia after 41 minutes and Javier Hernandez’s first for his new club after 76 minutes gave United control in the third Shield match between English football’s current “big two” in the last four seasons. Dimitar Berbatov, on as a late substitute, lobbed in United’s third in stoppage time after a clever ball from Nani which summed up United’s slicker passing and movement with the start of the new Premier League campaign six days away. Salomon Kalou had pulled one back for Chelsea six minutes from time when Edwin van der Sar, outstanding after a shaky start, could only parry a shot from Daniel Sturridge during a late rally by the champions who have now lost five of their seven pre-season games. 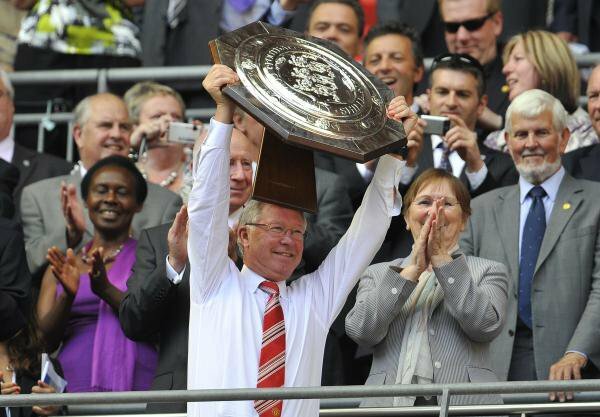 The Community Shield is rarely a pointer to the battles to come over the next nine months but is always a game the competing managers want to win and Sunday’s victory gave United manager Alex Ferguson the 45th trophy of his managerial career — the 35th he has brought to United at the start of his 25th season as their manager. The other winners on the day were the Wembley groundstaff who appear to have solved the pitch problems that have dogged the stadium since it re-opened in 2007. Unusually neither team fielded any new signings at kick-off, with Chelsea’s main summer import Yossi Benayoun and United’s Mexican striker Hernandez both on the bench. While the players were all totally familiar to the fans, some were less popular than others and four of the England squad who flopped at the World Cup – Chelsea’s John Terry, Ashley Cole and Frank Lampard and United’s Wayne Rooney — were jeered and booed by opposing fans in the early stages. The booing subsided after a while — apart from those directed at the always unpopular Cole — because United’s fans began to have something to cheer about as Paul Scholes dominated in midfield and, along with Ji-Sung Park, helped United take control. Scholes should have done better with a skied shot after nine minutes and Rooney went close before setting up their opener after a superb pass from Scholes four minutes before the break. Valencia took the chance excellently but there was little joy for Michael Owen, back at Wembley for the first time since he seriously injured his hamstring there in the League Cup final in February. Ferguson replaced Owen and Rooney at halftime as promised, with United fans getting their first glimpse of Hernandez, the 22-year-old Mexican striker tipped as a United star of the future. He did not disappoint either, doubling the score with a bizarre finish as he met a low cross and sent it into the net via his foot and face. Chelsea rallied in the closing stages after Sturridge and Didier Drogba came on but the champions, who beat United on penalties to lift the Community Shield last season, failed to impress.